It is no surprise to regular readers of c&g that i suffer from acne, and it is a real pain. I have documented all the different products I have ever tried and today's post brings you another product. 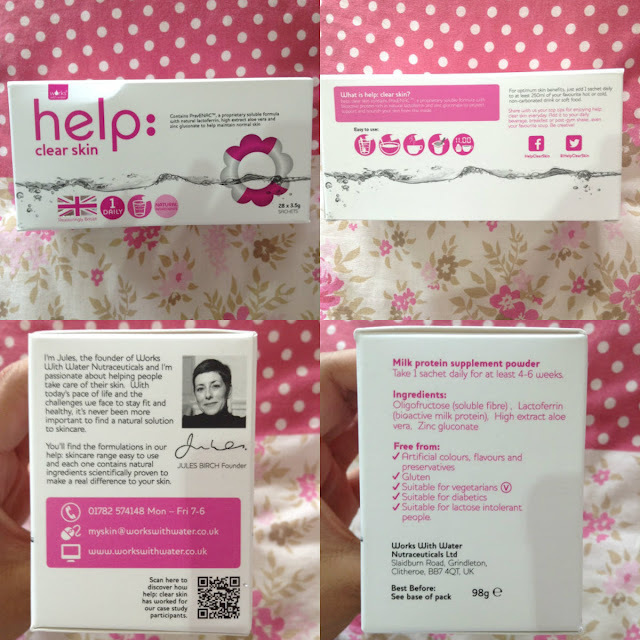 Let me introduce to you the help:clear skin a formula that has been proven to be rich in lactoferrin. Lactoferrin (very fancy) is something that helps to reduce the development of the bacteria that is mainly responsible skin impurities. I was kindly gifted the 28 day pack from the brand to test out and see how it works ,I finished my 28 days yesterday and in this post will be sharing my experience, thoughts and more about the product. In the box you get little sachets that you can take daily, you just mix the powder into a drink or some food, i went with water each time, stir until dissolved and then drink/eat. The big question, how did it work out? Well, it definitely got rid of the acne along my T Zone aka the problem are. The painful, under the skin pimples that I get all the time didn't seem to appear as much and also didn't hurt as much. Taste? Nothing, it dissolves into the water and then you honestly taste nothing! The only thing I recommended is that you take it with hot water/hot drinks not cold because it can be really difficult to mix well- like i experienced the first time around. I have absolutely loved the results from using this 'supplement' and if you are fed up of applying topical application to help with your spots, then I highly suggest trying this as an alternative. 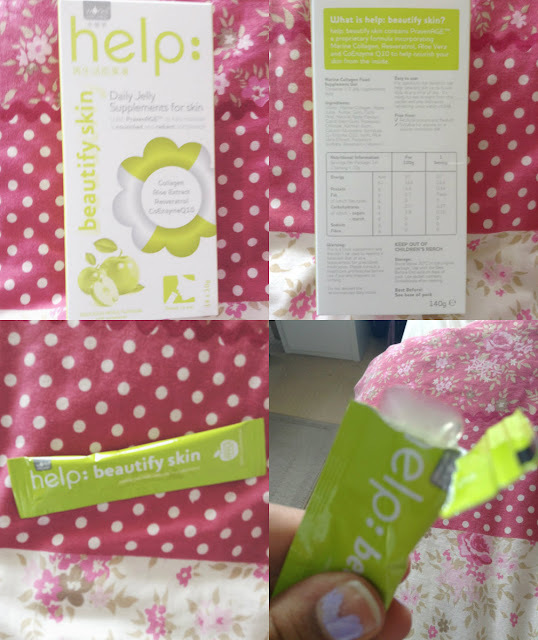 The other thing that I kindly got send was the help:beautify skin which is a really nice apple flavoured jelly supplement that doesn't need mixing anything with anything, you just have it in one go. The amazing apple tasting jelly is filled full of natural ingredients that have been proven to deliever anti-ageing benefits. There is alot lot of vitamins and goodness inside that benefits different areas of your skin, I was taking this every other day along with the powder and haven't experienced any side effects - touch wood. 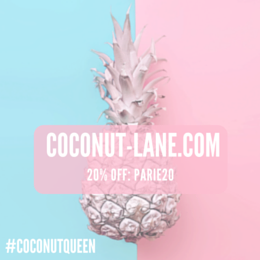 Overall, I have been really impressed with both of these products and if you are looking for something new to try then you should look on the website and view what works best for you.